Taco-seasoned lean ground beef with salsa and taco sauce in between layers of curly egg noodles smothered by melty cheddar cheese. The best of Mexican food meets a classic Italian favorite. Tacos + Lasagna = Perfection. I told you all about the pasta kick I’ve been on lately. As in, all of my meals this past couple of weeks have revolved around spaghetti, gnocchi, 5-ingredient caprese pasta, and creamy sweet potato pasta. And so when I was finally craving something different – tacos – I just had to go and put pasta in the mix. And I’m glad I did. It’s a winning combo. As good as chocolate + peanut butter combo I’d say. At least in a dinner, not snack/dessert, type of way. You get what I mean right? So, true to form with all of my other pasta recipes I’ve posted thus far, this dish whips up quick and easy. Under thirty minutes prep time which is perfect for the busy holiday season. You can even make this lasagna in, say, the morning and then keep it in the fridge all day and pop it in the oven later on when you are ready for dinner. Don’t you love when dinner can be convenient? I’ve also made a few healthier swaps. I couldn’t taste the difference one bit, buuuut I am used to healthier tasting food. The real test was my husband. He knows and loves his Mexican food. The conclusion: the swaps are definitely husband approved-he had no idea! So those swaps? I used Greek yogurt (usually Mexican food is smothered with full-fat sour cream) but you can substitute a fat-free sour cream if you’d like. Next, I used 1/3 less fat cream cheese. It was just as creamy as ever! I also used salsa as the base and in between layers which is a lot healthier, contains a lower fat content, and has a lower calorie total than a lot of Mexican sauces. These small changes make a huge difference to how much fat and how many calories you are consuming, but at no sacrifice for taste! 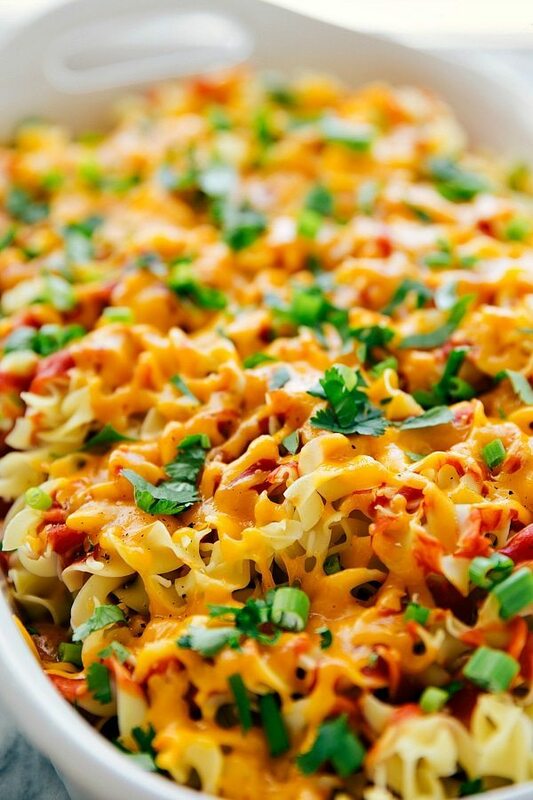 Another great thing about this cheesy taco lasagna is that you can choose the heat level that’s just right for you. Mild, medium, or (for those of you living on flavor’s edge) hot! This lasagna has salsa and taco sauce. Both of which you can pick mild, medium, or hot. Taco-seasoned lean ground beef with salsa and hot sauce in between layers of curly egg noodles smothered by melty cheddar cheese. In a large saucepan over medium-high heat, cook the ground beef all the way through. Drain any fat and then add in the taco seasoning packet, cream cheese, and Greek yogurt. Cook on low heat until all the ingredients are incorporated. In a 9 x 13 casserole dish, combine half of the ground beef mixture with 2 cups of salsa and spread on the bottom of the dish. 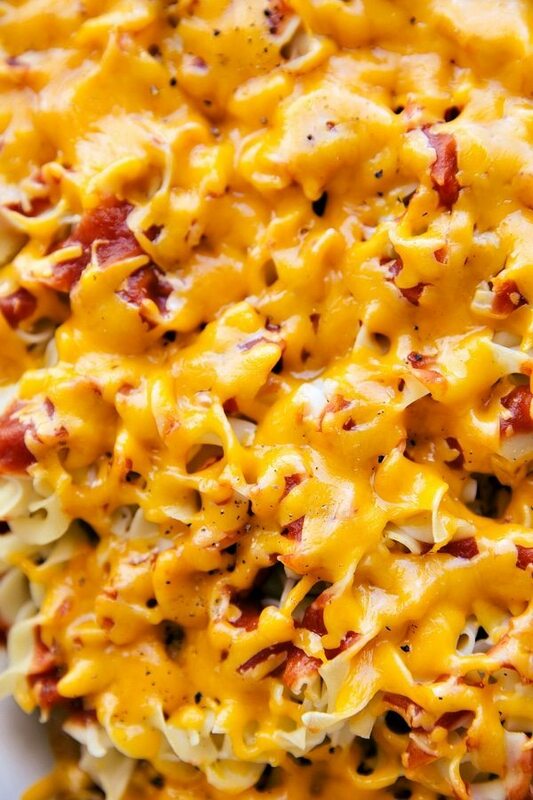 Layer half of the cooked noodles on top,1 cup of mild taco sauce, and one cup of cheese. Add 1 cup of salsa to the remaining ground beef mixture and layer that on top of the cheese. Add the remaining pasta noodles, the rest of the taco sauce (about 3/4 cup) and 1 more cup of cheese. Cover with foil and refrigerate if you are making the dinner for another time. Otherwise cook at 350 degrees F for about 25-30 minutes (covered with foil) or until cheese is melted. * You can substitute 2% plain Greek yogurt. This looks absolutely fantastic. I love your tex mex twist on this and the ease of the recipe. Thanks for sharing at Simple Supper Tuesday. Looks delicious and simple! I’ll just have to leave the cheese off of my portion. Thanks for a great new weeknight recipe! Looks delish and something our family would enjoy! Stopping by form Simple Supper Tuesday. Thanks so much for stopping by! My husband sure loved this meal a lot – I hope your family enjoys it as well! Wow, this looks incredible Chelsea! 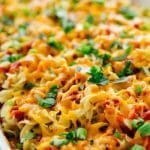 Love that you combined two of my favorites here – tacos + lasagna definitely = perfection 🙂 Can’t wait to try this recipe and thanks for sharing! Hope you have a great week! Thanks so much 🙂 Have a great week as well and enjoy thanksgiving! This is my kind of recipe. 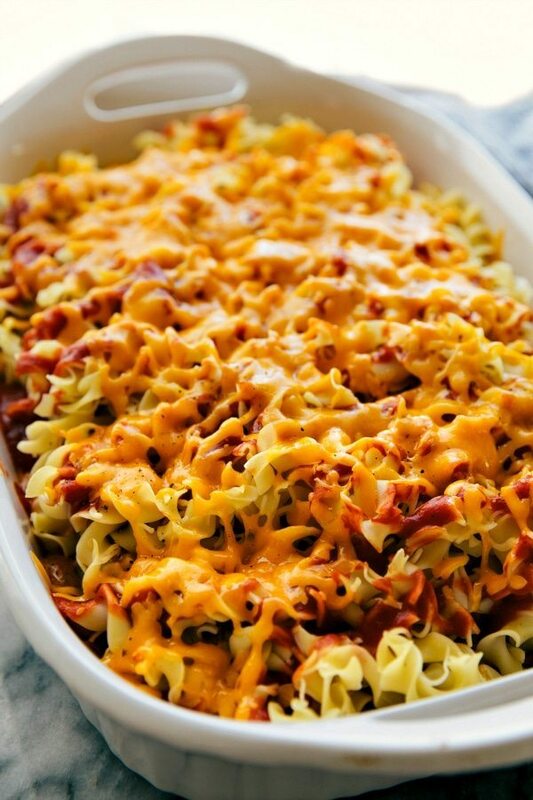 I love different styles of lasagna especially versions made egg noodles. This is exactly my favorite kind of dinner. The husband and kids will eat just about anything if it includes pasta and it’s a good way for me to sneak extra Mexican into the rotation without getting shouted at for always making Mexican. 😉 Love this! This looks amazing. I love the mix of mexican and italian, my two favorites. They are a great combo! Thanks for stopping by Stephanie! This looks delicious, can’t wait to try it! Stopping by and pinning from totally tasty Tuesdays link up.. Thanks for sharing! good lord am I really JUST finding this recipe?! ahhhh PINNING. I haven’t ever tried, sorry to not be of more help! I don’t think it would do great being frozen unfortunately.